AN ALIEN IN AN INCUBATOR! 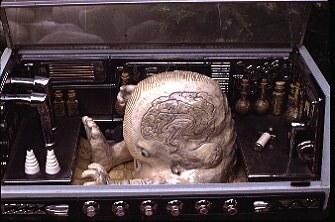 Between the years of1975 and 1980, Professor Clayton G. Bailey , of California State University, Hayward, built the Alien Incubator to hold a monsterous embryo-like creature poised at the control panel of its incubator control room. A bio-laboratory in action,with an alien life form in control of chemical apparatus and electrical panels sculpted in bas relief. All parts are ceramic except the metal case .